Hidimba Devi Temple also popularly knows as Dhungri temple and Hadimba Temple is located in Manali. Hadimba Temple Manali is one of the religious temple in Himachal Pradesh. Hidimba Temple is dedicated to devi Hidimbi. Temple is covered with forest and was built in 1553. The hidimba Temple is dedicated to devi hidimba who was wife of one of Pandav Bheema during Mahabharata time. Devi Hidimba temple is built around the cave where Devi Hidimba used to mediate . She was from a 'Rakshas' family and she had a brave, strong and fearless brother Hidimb. It is said that Devi Hidimba had vowed that one who will defeat his strong fearless brother Hidimb. She will marry to that person. One of Pandav ,Bheema when visited Manali, during Pandva's exile, he killed Devi Hidimba's brother Hidimb. So Devi Hidimba married to Bheema and gave birth to a son named 'Ghatotkach'. Temple of hidimba Devi was built in year 1553 by kullu king Raja Bahadur Singh. Hidimba Temple is built with very beautiful design and architecture. The temple of Hadimba devi is four story of wooden architecture, with a wooden 'shikhar' which is 24m long. This 'shikhar' or tower consists of 3 square roofs.The Hidimba temple base is made out of whitewashed, mud-covered stonework. Around 70 m away from temple there is shrine which is dedicated to Bheema and hidimba son 'Ghatotkach'. There is a massive rock inside the temple and said goddess hidimba used to meditate on it. There is 7.5 cm long brass image which represent devi hidimba. 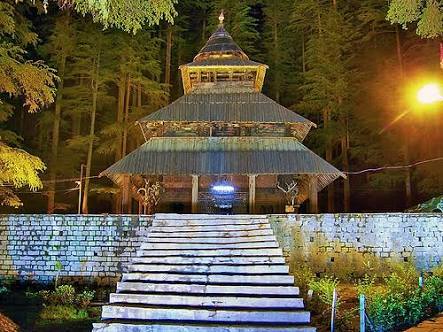 Hidimba temple is located near Manali market, it is at a walkable distance from Manali Bazaar. 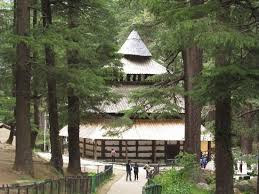 Hidimba temple is around 3 km from Manali bus stand. - 7.5 cm brass image represents devi hidimba. - There is no idol inside temple, only footprints of goddess Hidimba is located. - Area near Temple when seen by Google Satellite, the imprint of a giant foot spanning across the valley in the area near the temple can be seen. Best time to visit Hidimba Temple is during summer time ,it's cool even during summer time. Temperature is between 0 to 30 degree . How to reach Hidimba Temple ? Tourist and visitors can reach Hidimba Temple by road transport.